MANILA – Many pageant fans, including Filipinos, were surprised as “before and after surgery” photos of Miss Universe Venezuela 2018 Sthefany Gutierrez surfaced online. The photos were uploaded on Christmas Day by a certain Froilan Paez, a doctor who specializes in “aesthetic and functional nasal surgery,” according to his Instagram page. 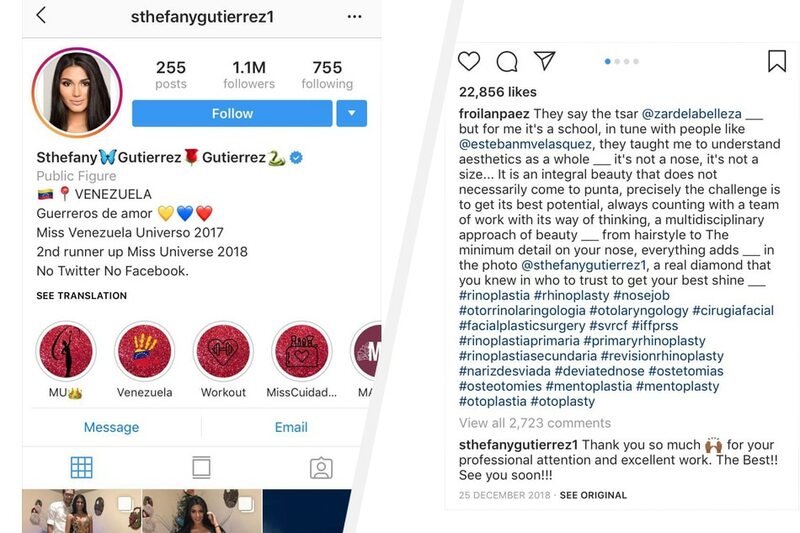 Paez shared side-by-side comparisons of Gutierrez’ face before and after surgery, and tagged the beauty queen’s verified Instagram account. A quick look at Paez’ Instagram page would show that he also shared a photo of Gutierrez last December 17, shortly after the Venezuelan beauty queen was named second runner-up to the Philippines’ Catriona Gray in Miss Universe 2018. Like in his other post, he used the hashtags #rhinoplasty and #nosejob, to name a few.